Argentine ants inhabit the area where earth and sand will be collected for reclamation work for on Futenma relocation plan (Photograph provided by the Ministry of the Environment). The U.S. and Japanese governments plan to move the facilities at Futenma to Henoko in Nago, where they will reclaim land to build a new base. The Japanese government intends to use earth and sand from Yamaguchi Prefecture. 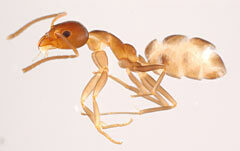 On December 3 the Ryukyu Shimpo found that the invasive alien species known as the Argentine ant, inhabits this area. Japanese law forbids the breeding and transporting of these ants. Ministry of the Environment documents state that the ants have damaged sugarcane overseas. The Civil Engineering and Construction Division of the Okinawa Prefectural Government (OPG) is checking the application for the reclamation. Concerned that Argentine ants will come in with the earth and sand, on December 4 the division asked the Okinawa Defense Bureau to explain the countermeasures they are planning. There are no previous cases of Argentine ants being found in Okinawa. As of July 2013, the ministry had found these ants breeding in 20 locations such as Tokyo, Kanagawa Prefecture, Osaka and Kyoto. The bureau plans to collect rock debris from Mukoshima in Hofu City and Kurokamijima of Shunan City in Yamaguchi Prefecture. The Japanese government has found that the ants breed in Iwakuni, Yanai and Hikari and Ube, which all are close to the areas where the bureau will collect the debris. The Japanese government has also found that the ants breed in Okayama City, about 25 kilometers northwest of Shodo Island, another area where the bureau will collect debris. Since 2006, the two prefectures of Hiroshima and Yamaguchi and four cities have set up a Broad-area Counter-Measures Group in an attempt to deal with the Argentine ant. They are cooperating to create a set of guidelines to deal with damage caused by the ants. The Ministry of the Environment has put together a book about controlling the Argentine ant. It says that the ants damage sprouts and flowers of agricultural goods. In Hiroshima and Yamaguchi, the ants bit people sleeping and have infested bedding. These prefectures regularly carry out extermination using bait containing an insecticide component. The Ministry of the Environment names the ant as an invasive alien species to Japan. As a general rule, the Invasive Alien Species Act bans the breeding and transporting of these ants. The International Union for Conservation of Nature and Natural Resources has listed the ant among the Top 100 Worst Invasive Species. The ministry found the ants breeding in Hatsukaichi City in Hiroshima Prefecture in 1993, and have confirmed the ants as existing in 20 areas nationwide. It is about 2.5 millimeters long. Competitive, it has been confirmed as sometimes driving out other ants in and outside of Japan.